Enjoy wine and pizza to our Farmers Market. Jeff Fleming formerly of Granby's NY Finest Pizza use select farm fresh ingredients to prepare in our wood fired pizza oven. And, get ready for summer barbecues, celebrations and parties by stocking up on locally grown food and wine. 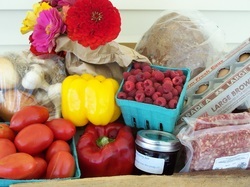 Prepare for summer with fresh veggies, meat, cheese and of course wine! Celebrate the Fourth of July with locally grown and produced foods! American produced food and wine for an American holiday! Preorder Roasts and Hams from local farms. For Sepe Farm lamb roasts contact Farmer Pete at (203) 470-4084 or their website. Pork Roasts & Hams available from Maple View Farm. Beef roasts available from Maple View Farm and Sweet Pea Cheese!